It’s been four years since we last saw Batman. But it’s been twice as long for Gotham, whose police force chased their would-be savior into hiding at the end of 2008’s THE DARK KNIGHT. Harvey Dent has been eulogized (and practically canonized). The dead district attorney—whom everyone thinks was killed by “vigilante” Batman—even has his own holiday of sorts. The anti-crime legislation he enacted has kept mobsters and murders behind bars for eight years. But maintaining Dent’s untarnished reputation has taken a toll on the men who know the truth behind Two-Face’s own crime spree, Police Commissioner James Gordon (Gary Oldman) and trust fund kid-turned caped crusader Bruce Wayne (Christian Bale). Gordon’s become a rebel without a cause. The grizzled cop doesn’t have nearly as much to do these days, but he surmises the city is enjoying its last days in the eye of a hurricane. Gordon’s at a crossroads personally as well as professionally; his family moved to Cleveland after The Joker’s reign of terror nearly cost him a son. Meanwhile, Wayne has isolated himself in the East Wing of his reconstructed mansion. He’s graying at the temples, nursing a bum leg, and neglecting the affairs of his family business. Caretaker Alfred Pennyworth (Michael Caine) laments Master Wayne’s “practiced apathy” and wishes his charge would just leave the town where his parents and girlfriend were killed. Start over. Be happy. Bruce’s curiosity is finally piqued when he discovers acrobatic maid-in-disguise Selina Kyle has swiped more from his safe than his mother’s prized pearls. His investigation of the burglary culminates with the arrival of Bane (Tom Hardy), whose machine gun-toting minions launch an all-out assault on Gotham’s constabulary. An early confrontation with the revolutionaries hospitalizes Gordon, prompting the disheveled Bruce to shave and suit up once more as the scapegoat superhero. Lucius Fox (Morgan Freeman) has his hands full keeping the financially floundering Wayne Enterprises in the black. He solicits help from shareholder Miranda Tate (Marion Cotillard), a pretty environmentalist with eyes on Wayne’s mothballed fusion reactor—but he makes time to show off some new Bat-Toys for Bruce in the Applied Sciences Department. Unfortunately, Wayne’s fortunes worsen when Bane wreaks havoc on the stock exchange, busts the felons out of Blackgate Prison, and cordons Gotham off from the rest of the world. Marshall law is declared, and nobody can find Batman now that he’s needed again. And it’s not that Bruce doesn’t want to help. Academy Award-winner Bale (THE FIGHTER) turns in his best Bruce yet, portraying the brooding billionaire in the nadirs and zeniths of his double-life. He’s gaunt and frail for the first act, but gung-ho, ferocious, and determined during the time-sensitive climax. And the middle? At the risk of revealing too much, we’ll just say Bale’s been put through these paces before in films like RESCUE DAWN and THE MACHINIST, and he acquits himself marvelously as a man trying to reconcile the emotional trauma he thought he’d smothered (but merely repressed) so long ago. Hardy’s baldheaded Bane wears a grill-like facemask that pumps anesthesia to dull the pain from a debilitating injury. Unlike the mindless brute depicted in Joel Schumacher’s BATMAN AND ROBIN, this incarnation of the DC villain is as shrewd and articulate as the leading man in any Shakespearean production. He’s also the first baddie in any Batman picture to prove an equal—if not superior—match for the hero in close combat. This Bane doesn’t need guns or genetically-modified growth hormones. Having already played a pugnacious prisoner in BRONSON and a misguided prizefighter in last year’s excellent WARRIOR, Hardy owns the Bane persona in much the same way that Heath Ledger simply was The Joker. His eyes pierce like knitting needles. He walks with a pronounced swagger, his arms moving with a stiff economy that conveys primal rage and intellectualized entitlement. He’s Napoleon in a gorilla’s body. His reverberating, studio-affected voice is the stuff of nightmares, and his speech pattern hails from a time and place far removed from Gotham’s 21st century spires. The stark, desperation-inducing film earns its PG-13 rating. There’s not a lot of onscreen bloodshed—but the multiple shootings, stabbings, neck-breakings, drownings, and hangings mean this Batman isn’t for the cartoon crowd. Toddlers would nary comprehend the goings-on anyway. 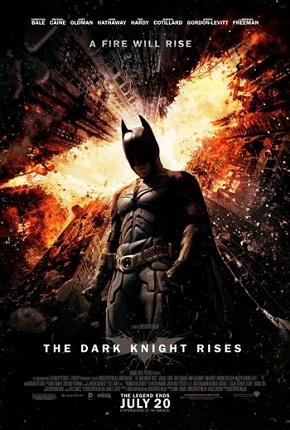 Unlike Joss Whedon’s AVENGERS, Christopher Nolan’s BATMAN trilogy keeps one boot planted in our world, the real world, where there are no enchanted hammers, super-soldier serums, or green goliaths to save the day. The tension in RISES is rooted in the all-too familiar fear of economic upheaval and the concomitant collapse of social order. And when the titular “super-hero” engages Bane, the fisticuffs are of the Jason Bourne / James Bond variety: knock-down, teeth-loosing, cheekbone-bashing brawls. Electromagnetic pulses may exist in Nolan’s universe, but web-shooters and repulsor rays don’t. And although his characters are skilled in the martial arts, their melees come off like brutal bar fights wherein combatants simply pummel one another until one of them can’t get up anymore. Nolan has masterfully stitched together strands from the best modern-day Batman plotlines, comingling Frank Miller’s brilliant 1986 graphic novel THE DARK KNIGHT RETURNS (depicting an over-the-hill Batman donning the mask to fight gangs) with the 1993-94 “Knightfall” comic book story arc, which sees Wayne’s hero replaced by a stand-in after he’s sidelined by newcomer Bane. The script ties all the loose ends handsomely, capping a thoroughly entertaining trilogy with the proper balance of excitement, class, and respect for the source material. Bruce Wayne finally makes sense of the counsel given by his surrogate fathers: “Know your limitations,” “Become more than a man…become a legend,” and “Why do we fall? To get back up.” By way of a thirty-year flashback, we’re even provided origins for The League of Shadows—and Ra’s Al Ghul, the duplicitous ninja mentor played by Liam Neeson in BATMAN BEGINS. The film is rife with religious allegory (Jesus falls for the third time, etc.) and it’s “can’t keep a good man down” message will resonate after leaving the theatre. But for the action-starved there’s no shortage of motorcycle chases, explosions, and karate-kicks (courtesy Hathaway, who is blessedly never actually called “Catwoman”). The Bat-Plane finally makes an appearance, and while Batman no longer drives his tank-like Tumbler, his opponents do. The cinematography is terrific, even if some edits are a little disjointed (one chase sequence at the halfway mark will leave some scratching their heads over the way it commences in broad daylight, then cuts suddenly to night). The aerial sequences—like Bane’s high-altitude escape before the title card—are probably breathtaking in IMAX (most of the film was shot that way), but the 160-minute film still casts a spell on traditional screens. Hans Zimmer delivers another brisk score that features percussive pulses, sinewy strings, and slow-building brass. RISES packs a lot of heart for a film whose characters spend most of their time panicking or wallowing in despair. But that’s precisely the point; where Bane allows for the illusion of hope, letting the very idea of salvation cripple Gotham’s denizens like a slow-acting poison, Nolan (and, vicariously, Batman) employs it as the catalyst for resurrection. His philosophical thesis—that the noble sacrifices of a few (or even one) can benefit many—is convincing (infectious, even) because that Greater Good can be achieved by ordinary average human beings. More than mere martyrdom, such selfless acts transform everyday people into icons, which in turn inspire future generations. Not everyone can be Thor or Green Lantern. Indeed, nobody can. But everyone has the capacity to be a hero. Anyone could be the Batman. 3 ½ out of 4 stars.